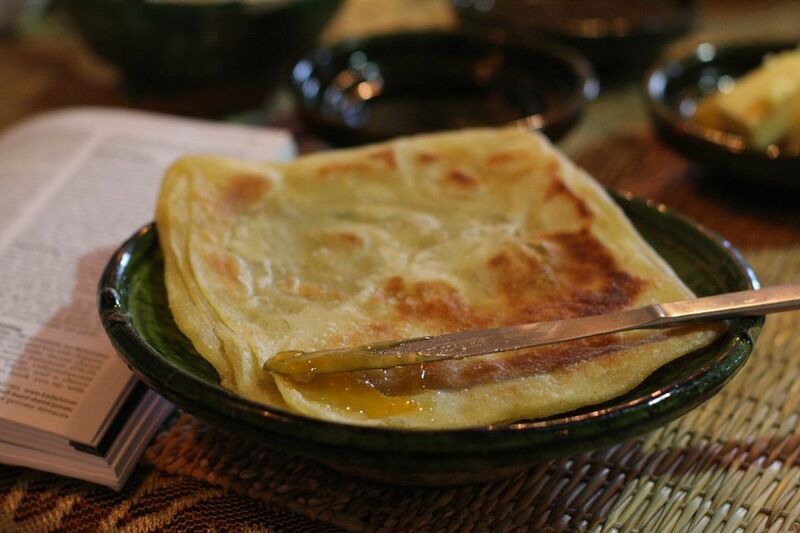 Msemen – also known as rghaif – is a type of Moroccan pancake which is folded into a square shape before being fried in a pan. If you've never seen this done, the process might seem confusing. It's quite easy, but admittedly a bit time-consuming. The following photos will show you how to flatten and fold the dough, and then cook it. First, make the msemen dough. Set out some vegetable oil, fine semolina, and soft unsalted butter. These will be used when shaping the dough. Prepare a large, smooth surface for working with the dough. A large plastic tray or a clean counter is fine. Spread the work surface with a little vegetable oil so the dough won't stick. Keeping your hands and the dough well-oiled, divide the msemen dough into smooth balls. Try the Moroccan method shown here. Grasp a large portion of dough and squeeze off a ball between your thumb and forefinger. It takes a little practice, but this method is an efficient way to control the size of the balls. Set the balls of dough on an oiled surface. Be sure the dough is well-oiled so that it won't dry out. If you are making a large quantity, you might want to cover the dough loosely with plastic as well. Allow the dough to rest a few minutes before working with it in the next step. The balls of dough shown here are about the size of apricots or small plums and will yield 4" to 5” square msemen. You can make msemen any size you like, but it is common to make them small so that you can fit more onto a griddle or into a pan to cook at one time. If you are cooking msemen one by one, you might want to make them larger and set up several pans. Take a ball of dough (work in order, starting with the first ball of dough you shaped), dip it in the oil, and use oiled hands to flatten and spread the dough into a very thin circle or irregular square. Make it as thin as you can without breaking the dough. A small hole or two in the dough is okay; they'll be concealed when you fold the dough. Dot the dough with butter and then sprinkle the dough with a little semolina. This will help keep the folded layers separate when the msemen cooks. Fold one side of the dough into the center as shown. Fold the opposite side into the center to make a narrow strip of dough. Fold one end of the strip of dough to the center. Fold the opposite end of dough to the center to make a square. Set aside the folded dough on an oiled surface. Repeat the process until all the balls of dough have been folded into squares. Heat a frying pan, cast iron skillet or griddle over medium to medium-high heat. Take a square of dough, and pat it with your fingers or palm of your hand to flatten it until approximately double in size. Place the msemen in the pan and fry, turning over several times, until golden brown and the center of the msemen is cooked (it should be chewy, but not gummy or raw). This should take several minutes. Repeat with all of the dough. Remove to a rack to cool, and enjoy!